We are happy to have Dr. Brian McAllister back with our Animal Kindness family. After graduating from Tuskegee College of Veterinary Medicine in 2005, he began his career here at our hospital over 14 years ago. He left us for a bit but has now returned! Many of our long time clients remember him and are happy to see him back. Dr. McAllister has always had a passion for animals and has a special fondness for cats. During his 14+ year career, he spent 5 specializing in feline care. Some call him the cat whisperer. But he missed working with dogs and other species, so now he can integrate all the things he has learned into Animal Kindness. Outside of work, Dr. Brian shares his life with his wife Jen and their crazy blended family. The kiddos include Luci, Dani, Campbell & Akeila. Their house is also shared with their dog Shadow (Dodo) and 5 cats Mr. Pineapple, Squeak, Shade, Spookay & Stretch. Fun facts: Die-hard Alabama fan. Loves his Redskins and Vegas Golden Knights. His favorite band is Weezer. Anything Marvel. 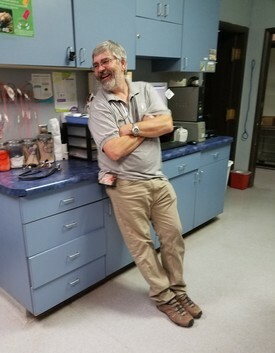 Dr. Jay Holt has always had a passion for animal health care, whether when he was working on his family's cattle farm as a youngster, spending all his extra time working with the animals at the Roos-N-More zoo in Moapa, to helping our furry loved ones here at Animal Kindness. 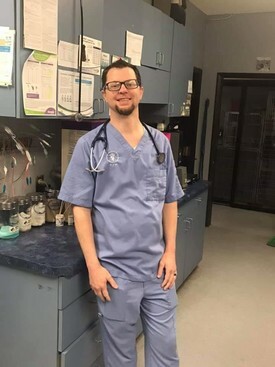 His love for teaching has not only inspired a generation of veterinary personnel but also our clients, who never leaves the clinic without knowing exactly what his plan of action is for their loved ones. Hobbies: Fishing, grilling, flying in his plane, and living life to it's full potential.